NEW ORLEANS, Louisiana, March 30, 2012 (ENS) – Bottlenose dolphins in Barataria Bay, Louisiana now are showing signs of severe ill health after coming in contact with oily waters from the BP oil spill nearly two years ago, warn NOAA marine mammal biologists and their local, state and federal research partners in a study released this week. Located in the northern Gulf of Mexico, Barataria Bay, received heavy and prolonged exposure to oil during the BP/Deepwater Horizon oil spill in the spring and summer of 2010. NOAA and its local, state and federal research partners started the Barataria Bay dolphin study in 2011 as part of the Natural Resource Damage Assessment, the process for studying the effects of the BP/Deepwater Horizon oil spill. NOAA is sharing the preliminary results from the study so that stranding responders and veterinarians can better care for live stranded dolphins and look for similar health conditions. 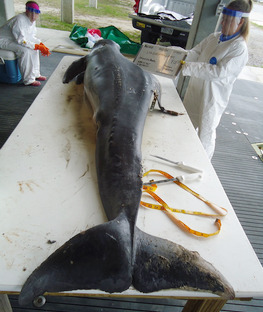 Comprehensive physical examinations of 32 live dolphins from Barataria Bay conducted in the summer of 2011, a year after the spill, show that many of them were underweight, anemic, and had low blood sugar and/or symptoms of liver and lung disease. Nearly half also have abnormally low levels of the hormones that help with stress response, metabolism and immune function. 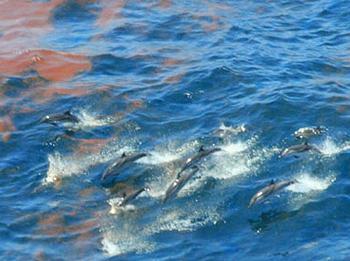 Researchers fear that some of the study dolphins are in such poor health that they will not survive. One of these dolphins, Y12, last observed and studied in late 2011, was found dead in January. The carcass of Y12 was recovered on Grand Isle Beach adjacent to Barataria Bay on January 31. The visible ribs, prominent vertebrae and depressions along the back were interpreted as signs of extreme emaciation. A necropsy was performed and samples were collected to help determine cause of death and potential contributing factors. Since February 2010, more than 675 dolphins have stranded in the northern Gulf of Mexico – from Franklin County, Florida, to the Louisiana/Texas border – a much higher rate than the usual average of 74 dolphins per year, says NOAA. The high number of strandings prompted the agency to declare an Unusual Mortality Event and investigate the cause of death for as many of the dolphins as possible. Most of the stranded dolphins were found dead. Just 33 stranded alive and seven were taken to facilities for rehabilitation. In the spring, it is usual to see some newborn, fetal and stillborn dolphins strand, and there has been an increase in strandings of this younger age class during this Unusual Mortality Event in 2010 and 2011. Yet all age classes continue to strand at high levels, the scientists say. Some waters in the northern Barataria Basin, a larger area that includes Barataria Bay, remain closed to commercial fishing, as visible oil is still present along the shoreline where the closures are in place. NOAA and its state and federal partners are researching the many ways Gulf dolphins may have been exposed to oil, including through ingestion, inhalation or externally. Researchers say the dolphins could have ingested oil from sediments or water while feeding or by eating whole fish, including internal organs and fluids such as liver and bile, which can harbor toxic chemicals.